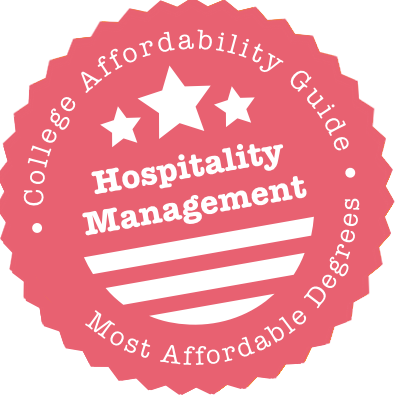 Scroll down to see the most affordable hospitality management degrees, as well as info on the different types of hospitality management degrees and program accreditation. The Department of Recreation, Parks and Tourism Sciences at Texas A&M University offers degrees at the bachelor's, master's and Ph.D. level. Undergraduates choose an interest area and complete a 19-credit certificate program in: parks and conservation, tourism management, park and rec administration, or youth development. They also complete an internship in the industry to gain hands-on experience. Students in the master's program can choose a thesis or non-thesis option. The department administers about 10 named scholarships, many with multiple recipients, for undergraduates, and another dozen scholarships, some with multiple recipients, for graduate students. Criteria varies, but typically these scholarships are for students with a particular career focus within the parks, tourism, and conservation field. Students enrolled in the Department of Hospitality and Tourism at Buffalo State SUNY can earn a Bachelor of Science in Hospitality Administration or an undergraduate minor in hospitality administration. The BS in Hospitality Administration is offered in two concentrations: restaurant and institutional management, and hotel tourism management. Students can choose one or both concentrations. The BS curriculum includes 30 credits of core hospitality management courses and 12 credits of concentration courses. The hospitality administration minor requires 18 credit hours, including three core courses and three electives. Buffalo State's Hospitality and Tourism Department is accredited by the Accreditation Commission for Programs in Hospitality Administration (ACPHA). Scholarships available to hospitality students include the Steven A. Daniels Scholarship and the Mildred Sipp and Alma Roudebush Scholarship. The Department of Management at Appalachian State University offers a BSBA in Hospitality and Tourism Management that allows students to tailor their studies to either a hospitality industry career focus or a tourism industry career focus. The BSBA in Hospitality and Tourism Management includes core business courses, hospitality core courses and a six-credit hour internship. Students in the program can also participate in student groups like the Hospitality and Tourism Management Student Association, which offers professional development and recruiting opportunities. Scholarships available to hospitality and management students include the Andrew Lane Memorial Endowment for Hospitality and Tourism Management and the Sesilee Cher Tomlin Endowed Scholarship for Hospitality Management. At the University of Massachusetts in Amherst, the Department of Hospitality and Tourism Management is housed at the Isenberg School of Management. The department offers a Bachelor of Science (BS) in Hospitality and Tourism Management program that lets students customize their academic program to support their personal interests and professional goals. The program provides hands-on training via experiential learning labs, research projects and internship opportunities. There is also a Doctor of Philosophy (PhD) in Hospitality and Tourism Management program available. Students admitted to this program can choose to specialize in one of the following areas: leadership, information technology and social media, marketing/consumer behavior, and organizational research and finance. At St. Cloud State University, the hospitality program is housed in the Department of Geography and Planning, which grants a Bachelor of Arts in Travel and Tourism and a Master of Science in Geography in Tourism Planning and Development. Undergraduate tourism majors can complete an internship to gain hands-on experience and develop industry contacts, with more than 50 companies providing internships. Students can also join faculty members on educational tours of international tourist destinations. The master's program has a focus on sustainability and eco-tourism. Students can take courses in topics such as tourism development and community heritage. The department has several endowed scholarships, including the Kazeck Scholarship in Geography that is open to tourism majors. The Department of Family and Consumer Sciences at California State University-Long Beach offers a BS in Hospitality Management that is accredited by the Accreditation Commission for Programs in Hospitality Administration. The BS curriculum includes major core courses, 12 credits of enhanced professional knowledge and specialization courses, as well as a three-credit internship that requires 800 hours of approved work experience. The Department also offers a Master of Arts in Family and Consumer Sciences with a concentration in hospitality management that offers a thesis track of study and a project track of study. MA students are required to complete four core courses, as well as specialization courses that include an internship and independent study. The Department of Apparel, Events and Hospitality Management at Iowa State University offers an undergraduate major in hospitality management, as well as master's and doctoral degrees in hospitality management. The undergraduate program in hospitality management requires 47 to 50 credits of hospitality management core courses, including a professional internship. The Master of Science in Hospitality Management is offered in a thesis and non-thesis track of study, and the Doctor of Philosophy in Hospitality Management is offered in traditional and distance learning formats. The Hospitality Management program at ISU gives out over $25,000 in scholarships to its students annually. The Hospitality program in Ferris State University's College of Business offers bachelor's degrees in hotel management and resort management, associate's degrees in dietary and food service management and restaurant and food industry management, and minors in club management, restaurant food industry/hotel management, and special event and meeting planning. Additionally, Ferris State offers combined degree program that leads to an AAS in Restaurant and Food Industry Management and a BS in Hotel Management. Certificate programs are also available in club management, culinary management, hotel management, restaurant and food industry management, ski resort management, special event and meeting planning, and sport, spa and entertainment. Scholarships available to hospitality students include the Hospitality Management Alumni Endowed Scholarship and the W. S. Garrison Endowed Scholarship. The hospitality and tourism management program at North Dakota State University ensures students understand the business side of the hospitality industry by requiring all majors to take a 24-credit minor in business. Students get plenty of hands-on experience, too, including classes where they plan menus and cook the food, beverage tastings, and field trips to hospitality venues. Additionally, all majors complete a summer internship between their junior and senior year (paid internships are allowed). The department also organizes optional off-campus study tours where students visit a hospitality destination and meet industry professionals. There are departmental scholarships, and students can apply for scholarships sponsored by major hospitality organizations like the National Restaurant Association. The School of Hospitality Business in Michigan State University's Eli Broad College of Business offers an undergraduate major in hospitality business, Master of Science degrees in foodservice business management and hospitality business management, as well as an MBA degree with a hospitality business concentration. Students in the undergraduate program focus on three areas of study: integrative studies, business and hospitality. They are also required to complete two paid internships during the course of their studies. The MS in hospitality business management is a non-thesis program that includes 24 credits of core coursework, electives, as well as a three-credit field study project. The School of Hospitality Business offers several scholarships to its students, including the Philip M. Becker Expendable Scholarship and the Robert A. Faber Scholarship Fund. At the University of North Carolina Greensboro, the Department of Marketing, Entrepreneurship, Hospitality & Tourism is part of the Bryan School of Business and Economics. The department offers a Bachelor of Arts (BA) in Sustainable Tourism & Hospitality program. Students develop core business and foreign language skills as well as applied knowledge of sustainable development, corporate responsibility, the process of greening hotel facilities, and current global and economic issues. Students admitted to the program can apply for the following scholarships: John Rothkoph Scholarship in Hospitality Management ($1,000 per year), Marriott-Bodeen Endowed Scholarship ($750 per year), and the Avren Scholarship ($1,000 per year). St. Joseph's College has three concentration areas for its Bachelor of Science in Hospitality and Tourism Management: tourism management, hotel management, or health care hospitality. Students are required to perform an internship in the area of concentration. The major is available at both the Brooklyn campus and the Long Island campus. St. Joseph's also has a major in hospitality and tourism management for professionals and adult learners. The college is home to the Institute for Hospitality and Tourism Management, an organization that holds symposiums on industry issues and provides networking opportunities that students may attend. WVU is the only public university in the Mountain State to offer a Hospitality and Tourism Management degree. Student interns rack up hands-on experience at a campus cafe and the Stonebridge-Morgantown Marriott at Waterfront Place. And throughout the year, the Hospitality Club works with other student organizations to host special events. Students are well-served by the program's relationship with Fresh Hospitality, an alumni-run space for food entrepreneurs that sits adjacent to campus. One of Fresh Hospitality's partners funds the eponymously named Doug and Pam Van Scoy Hospitality and Tourism Scholarship as well as experiential scholarships for those needing aid as they practice in the field. The local Marriott also sponsors an award. The School of Hotel and Restaurant Administration at Oklahoma State University offers an undergraduate degree program that includes a strong experiential component. Students are required to complete 800 hours of work experience through an internship and also receive hands-on experience in two restaurants operated by the School and experiential learning labs at local hotels. The School's Master of Science in Hospitality Administration is a 32-credit program that is offered in two tracks of study: one requiring a thesis and one requiring a creative component. The PhD in Human Sciences with a specialization in hospitality administration requires 60 credits beyond the master's degree, including 15 credits of dissertation coursework. Hotel and restaurant administration scholarships include the Richard J. Brewer Scholarship and the Baker Bokorney Scholarship. SUNY Plattsburgh has a Bachelor of Science program in Hotel, Restaurant, and Tourism Management that requires all students to acquire at least 600 hours of field experience in the hospitality industry during their college career. Working in the industry gives students a deeper understanding of the business and helps students when they start their career. To earn the degree, students must complete 71 to 77 credits in the major, including classes in tourism, hospitality marketing, food and beverage cost control, lodging operations management, and hospitality law. The program has a strong emphasis on business management, and many students minor in business while earning the hospitality degree. The hospitality program runs a campus restaurant where students gain management skills. The University of North Texas offers a Bachelor of Science in Hospitality Management as well as a Master of Science in Hospitality Management. In this program, students will gain the knowledge and experience necessary to manage everyday functions in a hospitality business. This includes learning how to run and profitable business and provide high quality customer experiences. The programs at UNT offer highly sought after internship and job placement opportunities within the Dallas-Fort Worth region and beyond. Students will take courses such as Career Development in Hospitality Management, Managing a Diverse Workforce, and Recent Developments in the Hospitality Industry. The Department of Recreation and Tourism Management at California State University-Northridge offers a Bachelor of Science in Tourism, Hospitality and Recreation Management that allows students to tailor their coursework to areas of focus like tourism management, outdoor recreation, event planning/management and hospitality management. The undergraduate curriculum requires 36 core credits, including a three-credit senior internship. The Department also offers a Master of Science Degree in Tourism, Hospitality and Recreation Management with concentrations in tourism management and recreational sport management. The MS curriculum includes 15 core credits and 12 credits in an area of specialization. The Department of Recreation and Tourism Management is accredited by the Council on Accreditation for Parks, Recreation, Tourism and Related Professions (COAPRT). Students who are interested in careers in the hospitality industry can enroll in the Bachelor of Business Administration (BBA) in Hospitality Management program at SUNY College of Technology Delhi. The program has five areas of concentration: Club Management, Culinary Arts, Hotel and Resort Management, Restaurant and Food Service Management, and Travel and Tourism Management. The school participates in the Disney College Program that allows students to work at Walt Disney in Orlando, Florida for six months for a unique working/learning experience. SUNY also offers an Associate in Applied Science (AAS) in Hotel & Resort Management program. The Collins College of Hospitality Management at California State Polytechnic University-Pomona offers several degree options in the field of hospitality management. The BS in Hospitality Management allows students to choose concentrations in restaurant management, hotel/resort management and club management. BS students are also required to spend 800 hours in a hospitality management internship experience. The Master of Science in Hospitality Management is offered in a thesis track for students interested in pursuing a PhD and a professional paper option those looking solely for professional development. The College also offers an MBA with a hospitality management emphasis through a partnership with the College of Business Administration. Scholarships offered through the Collins College of Hospitality Management include the CCHM Student Scholarship and the Darden Award of Excellence. The Department of Management at the Harmon College of Business and Professional Studies has four Bachelor of Science in Business Administration (BSBA) programs: Entrepreneurship and Social Enterprise, Hospitality Management, Hotel and Restaurant Administration, and Management. The Hospitality Management program prepares students for a wide range of careers in the hospitality service industry such as Food and Beverage Director, Hotel Manager, Conference Coordinator, HR Director, Purchasing Manager, and many more. The program includes courses in Human Resource Management, International Management, Organizational Policy and Strategy and Tourism Marketing. Students earning a bachelor's degree in hospitality administration from Stephen F. Austin State University are required to complete a supervised internship with at least 300 hours of work. In addition to that real-world experience, students can network and learn more about the field through campus organizations such as the Hospitality Administration Student Association, which organizes trips to local venues and national events. Hospitality majors take about 60 credits in the major and another 12 credits in a focus area: culinary, lodging, meeting and planning, travel and tourism, or restaurants. Hospitality majors are eligible for several dedicated scholarships, such as the Aramark Scholarship or the Lauren Alston Memorial Scholarship, which both require a 2.5 GPA. Indiana University Purdue offers a Bachelor of Science in Tourism, Conventions, and Event Management degree that provides students with training and instruction in the different aspects of the hospitality and tourism industry. The School of Physical Education and Tourism Management has partnered with the university's Kelly School of Business to give students the chance to earn a certificate in business foundations that will enhance their undergraduate degree in tourism. There is also a Master of Science in Event Tourism (MSET) degree available. This program offers tracks in research and in sport event tourism. Qualified MSET students are given graduate assistantships, which cover full tuition, health insurance, and a 10-month stipend with opportunities for employment during the summer. The University of Southern Maine offers a Bachelor of Arts in Tourism and Hospitality, a minor in tourism and hospitality, and a certificate in tourism development and planning. The B.A. in Tourism and Hospitality is a 39-credit, interdisciplinary degree with concentrations in tourism creation and promotion; managing in tourism and hospitality; event planning, management and promotion; tourism planning, development and sustainability; sport tourism and adventure tourism; and cultural and culinary tourism. Students have the option to complete up to two concentrations, although no more than one course can be used toward both concentrations. Students in all concentrations are required to complete a capstone experience. The certificate in tourism development and planning requires 12 credits of coursework and the minor in tourism and hospitality requires a minimum of 15 credits. At Western Carolina University, the School of Marketing, Entrepreneurship, Sport Management, and Hospitality & Tourism is part of the College of Business. The school offers Bachelor of Science (BS) degrees in the following areas: Entrepreneurship, Hospitality & Tourism, Sales & Marketing, and Sport Management. The Hospitality and Tourism program prepares students for careers in a wide range of hospitality and tourism areas by including courses in accounting, enterprise information systems, restaurant, lodging and resort management, legal and ethical environment issues, and marketing planning and strategy. Western Carolina University's College of Business is accredited by the Association to Advance Collegiate Schools of Business (AACSB). San Diego State University's School of Hospitality and Tourism Management offers a Bachelor of Science in Hospitality and Tourism Management with emphasis areas in hotel management, meetings and events, restaurant management and tribal gaming. The School also offers a Master of Science in Hospitality and Tourism Management, which is a 17-month cohort program that includes two face-to-face courses and eight online courses. Additionally, the School offers a Bachelor of Science in Recreation and Tourism Management with concentrations in outdoor resource management, recreation systems management and sustainable tourism management. Students in the School of Hospitality and Tourism Management are eligible for scholarships like the Study Abroad Scholarship (up to $1,000) and the Bonnie Jean Gore Scholarship. Through its Department of Hospitality Management, San Jose State University offers a BS in Hospitality, Tourism and Event Management that teaches students the logistics of running a hotel, restaurant or other hospitality-oriented business. The program curriculum includes 39 credits of core coursework that provides students with a foundational knowledge in hospitality management strategies, hospitality information systems, resort and club management, and the legal and marketing components of hospitality management. Students in the Department can also participate in student organizations like the Hospitality Financial and Technology Professionals (HFTP) Student Chapter and the Hospitality Event Management Society. The School of Hospitality Leadership at the University of Wisconsin in Stout offers a Bachelor of Science in Hotel, Restaurant and Tourism Management (HRTM) program that combines classroom instruction with hands-on training to prepare students for various careers in the hospitality industry. The school has agreements with over 100 hospitality establishments all over the country and around the world that provide HRTM students with internship and co-op opportunities. The curriculum includes coursework in food service production and operations management, hospitality and tourism marketing and sales, security and risk management, and hospitality law and liability. Minors are available in lodging management, property management, and tourism. The school will offer a Master of Science in Hospitality Strategy beginning in the fall of 2017. The Hospitality and Tourism Management Department at San Francisco State University offers a BS, minor and certificate in hospitality and tourism management, as well as an MBA with an emphasis in hospitality and tourism management. The BS in Hospitality Management is offered in several emphases areas, including hotel operation management, restaurant and catering management, international tourism management, hospitality entrepreneurship management and hospitality labor relations management. The MBA with an emphasis in hospitality and tourism management includes core MBA requirements, three emphasis courses and five electives. Scholarships available to hospitality and tourism management students include the $10,000 Bill Kimpton Hospitality Scholarship and the $1,000 Lawrence Chan Scholarships for Hospitality Management Students. The College of Education and Human Sciences at the University of Nebraska Lincoln offers a Bachelor of Arts (BS) in Hospitality, Restaurant and Tourism Management. Students admitted to this program can choose from the following areas of emphasis: Event Planning, Food and Beverage Management, Human Resources, Lodging, and Tourism. There is also a Master of Science (MS) in Hospitality Management program available. MS students are required to engage in a major research project and write a thesis to graduate from the program, although they do not have to choose an area of specialization. Course selection is flexible and students are given the freedom to tailor their program according to their interests and professional goals. WSU's School of Hospitality Business Management is part of the Carlson College of Business. The school offers a Bachelor of Arts (BA) in Hospitality Management program that allows students to major in either hospitality business management or wine business management. Students have access to the Marriott Foundation Hospitality Teaching Center that features a modern teaching/production kitchen, a formal dining room, and a wine tasting area. The school also offers a Doctor in Philosophy (PhD) in Business Administration program, with a concentration in hospitality and tourism. Since the school is part of the Carlson College of Business, students admitted to any of the school's programs can apply for Carlson College scholarships. For the academic year 2013-2014, Carlson College awarded nearly $600,000 in scholarships. The Rosen College of Hospitality Management at the University of Central Florida offers a Bachelor of Science (BS) in Hospitality Management degree. Students admitted to this program have access to state-of-the-art facilities including high-tech classrooms, a 200-seat training dining room and bar, two test kitchens, and a beer and wine laboratory. Rosen College also offers Master of Science (MS) and Doctor of Philosophy (PhD) in Hospitality & Tourism Management programs. The MS program has a thesis and non-thesis track, and can be delivered face-to-face, completely online, or in a hybrid format. For medical doctors interested in exploring the practice of medicine within the hospitality industry, Rosen College has an MD Track within the MS in Hospitality and Tourism Management program. The Department of Hospitality Management and Dietetics at Kansas State University offers a Bachelor of Science in Hospitality Management, a Master of Science in Hospitality Management and Dietetics Administration, a concurrent Bachelor of Science and Master of Science in Hospitality and Dietetics Administration and a PhD in Hospitality and Dietetics Administration. The BS in Hospitality Management is offered in three concentration areas: foodservice and restaurant management; convention, meeting and event management; and lodging management. The BS curriculum includes 34 credit hours of hospitality management courses, 15 credits of business support courses and 21 credit hours in a concentration area. The Department of Hospitality Management and Dietetics offers various assistantship opportunities to students enrolled in the MS and PhD program that provide them with tuition assistance and salaries. The Bachelor of Science in Hotel and Restaurant Management at Niagara University allows students to choose an area of concentration and an area of focus within that concentration, giving depth to each student's expertise. Students who concentrate in Hotel Planning, Development and Operations can focus on either operational planning or property development. Those concentrating on Food and Beverage Management can focus on either entrepreneurship or food and beverage operations management. Majors concentrating in Luxury Hospitality Operations can focus on resort and spa management or club management. The Hotel and Restaurant Management program ensures students have both theoretical knowledge and practical skills when they enter the work force. The department also has a bachelor's program in Tourism and Event Management. The School of Hospitality Leadership in East Carolina University's College of Human Ecology offers a BS in Hospitality Management, a minor in hospitality management and an MBA with a hospitality management certificate. The BS in Hospitality Management offers three areas of specialization: conventions and special events, food and beverage, and lodging. The BS includes 45 credits of hospitality core coursework and 18 credits in a concentration area. The MBA with a certificate in hospitality management requires four hospitality management courses that teach students about current issues and strategies in hospitality management, as well as advanced management techniques in conventions and special events, food service and beverage management, and lodging operations. Scholarships available to hospitality management students include the Aramark Scholarship and the Irwin C. Roberts Scholarship. The Conrad N. Hilton College of Hotel and Restaurant Management offers the following degrees: Bachelor of Science (BS) in Hotel and Restaurant Management, Master of Science (MS) in Hospitality Management, and a Doctor of Philosophy (PhD) in Hospitality Administration. A dual BS/MS program is also available that allows students to earn both degrees in just five years. There is a joint MS/MBA (Master of Business Administration) program offered through a partnership between Hilton College and the University of Houston's C.T. Bauer College of Business. The college has a unique MS in Global Hospitality Business program offered in partnership with Ecole hoteliere de Lausanne and the School of Hotel and Tourism Management at the Hong Kong Polytechnic University. Grand Valley State University's Department of Hospitality and Tourism Management offers a Bachelor of Science in Hospitality and Tourism Management, as well as an undergraduate hospitality and tourism management minor. The B.S. program is available in five concentrations: tourism management, food and beverage management, lodging management, meeting and event management, and recreation and leisure management. B.S. students are required to complete 36 credits of core courses in subjects like computing, hospitality law, hospitality research, hospitality marketing and statistics. The program also requires 15 credits in an area of emphasis and seven credits of field experiences. Hospitality and tourism management students also have the opportunity to study abroad and participate in student organizations like the American Hotel and Lodging Association and the Hospitality and Tourism Management Club. The College of Education, Health, & Human Sciences at the University of Tennessee offers retail, hospitality, and tourism management programs on both the baccalaureate and graduate levels. Students receive in-depth instruction and hands-on training in different aspects of the hospitality and tourism field including food and lodging cost control, human resources management in the services industry, hotel and resort operations, and convention and meeting planning. Students can take advantage of the partnership that the university has established with the Culinary Institute and the Rocky Top Institute to gain first-hand, real-world experience in brand management, marketing, and product development. The Doctor of Philosophy in Retail, Hospitality, and Tourism Management program prepares students for careers in the academe as well as in research. Housed within Florida State University's School of Business, the Dedman School of Hospitality offers undergraduate and graduate programs in hospitality management. The Bachelor of Science in Hospitality Management includes majors in global club management, hospitality management and PGA golf management. The hospitality management major requires general business courses and six core hospitality courses, along with 12 credits of hospitality electives. All three undergraduate majors require internships that can be completed domestically or abroad. The School also offers a 33-credit Master of Business Administration with a major in hospitality and tourism management. Scholarships available to hospitality students include the Ashby Stiff Undergraduate Scholarship and the Bessie Morgan Marshall Scholarship. The School of Business at Richard Stockton College of New Jersey is home to the Department of Hospitality and Tourism Management Studies. The department offers a program of study that leads to a Bachelor of Science (BS) in Hospitality and Tourism Management degree. Students admitted to the program receive training in general and specialized areas of the industry and are required to take courses that give them a strong foundation in key business areas as well. The university established the Lloyd D. Levenson Institute of Gaming, Hospitality and Tourism (LIGHT) that gives students the opportunity to engage in research and public policy discussions of the issues that affect the hospitality industry in the region. The Department of Hospitality and Tourism Management at the College of Charleston offers a BS in Hospitality and Tourism Management that allows students to focus their coursework hotel and resort management, food service management or events management. Additionally, students in the Hospitality and Tourism Management program can choose an emphasis in sales and marketing, human resource management or general management. Students are also required to complete an internship their senior year that can be paid without academic credit or unpaid with academic credit. The Department of Hospitality and Tourism Management provides numerous scholarship opportunities to its students, including the $10,000 Wine and Food Festival Education Award and the $3,000 Wild Dunes Resort Hospitality Management Scholarship. Central Michigan University's Department of Marketing and Hospitality Services Administration offers a BSBA in Hospitality Services Administration that prepares students for careers in the hospitality industry. Housed within the College of Business, the Hospitality Services Administration (HSA) program provides students with a foundation of general business knowledge, as well as specific insight into the management of lodging operations, restaurants, clubs, casinos and tourism. Coursework teaches students about how general business topics like accounting, finance, management, marketing and facility operations apply to hospitality industries. HSA students are also required to complete a three-credit summer internship that provides work experience in hospitality operations. Scholarships available to HSA students include the LaBelle Management Scholarship and the William Brehm Scholarship. The School of Human Environment Sciences at the University of Kentucky offers a Bachelor of Science (BS) in Hospitality Management and Tourism program through its Department of Retailing and Tourism Management. The curriculum integrates marketing techniques, service management principles, and financial management to prepare students for careers in a variety of tourism and hospitality settings. There is also a Master of Science (MS) in Hospitality Management and Tourism program. Students admitted to the program can choose either a thesis or non-thesis track. The undergraduate programs at the School of Human Environment Sciences are accredited through the American Association of Family and Consumer Services (AAFCS). Lewis-Clark State College offers the following degrees in hospitality management: Bachelor of Arts (BA), Bachelor of Science (BS), Associate of Applied Science (AAS), and Bachelor of Applied Science (BAS). There is also an Advanced Technical Certificate (ATC) in hospitality management available. Students accepted to the BA/BS program follow a curriculum that includes upper division courses in topics such as hospitality marketing, food service systems and controls, business law, events management, and information systems for managers. Courses for the AAS and ATC programs are certified by the American Hotel and Lodging Association and the National Restaurant Association. Applicants for the BAS degree must have already earned an AAS degree in the same major to be considered for the program. It’s a good time to be in the hospitality business. According to the World Travel & Tourism Council, the travel and tourism industry is expected to pump $10 trillion and 328 million jobs into the global economy by 2022. Graduates with hospitality management degrees are ideally placed to find work in hotels, casinos, restaurants, resorts, theme parks, cruise ships and similar settings. Even better, U.S. employment for meeting, convention and event planners is projected to grow 33% from 2012 to 2022 – much faster than average. With all this growth, it follows that hospitality employers will be needing well-qualified candidates. But before you lay your education money down, take a quick look at our guide. In addition to exploring degree options, sample courses and career opportunities for each level, we cast a critical eye on program accreditation and options for professional certification. Do I Need a Hospitality Management Degree? You don’t need a degree for entry-level work in the hospitality industry – some professionals start with a high school diploma and gain managerial and administrative experience on-the-job. Plus, there are many high schools that offer hospitality job training assistance. Nevertheless, a university degree will go a long way to improving your career opportunities. Most full-service hotel chains now prefer job candidates for supervisory positions to hold a bachelor’s degree. To become a corporate director or manager of a 5-star establishment, you’ll probably have to aim even higher (e.g. an MBA in hospitality management). An associate’s degree in hospitality management is a 2-year undergraduate program that explores the fundamental issues of the hospitality industry. Programs are offered at community colleges, universities and technical institutes. Associate of Applied Science (AAS) in Hospitality Management: Often earned by students who wish to go straight into the workforce. Associate of Science (AS) in Hospitality Management: A popular choice for students who wish to earn credits for a bachelor’s degree. Most associate’s degrees are a mix of general education classes (e.g. college writing, communications, personal finance) and courses focused specifically on hospitality issues. Hospitality management classes might cover accounting, organization and administration, tourism planning, restaurant management, customer service, human resources and employee management. A bachelor’s degree in hospitality management is a 4-year undergraduate program that trains students in every aspect of the hospitality industry. Because of this, most full-service hotel chains prefer managerial candidates to hold a bachelor’s degree in hospitality/hospitality management. Bachelor of Business Administration (BBA) in Hospitality Management: Typically built on a set of core business courses (e.g. accounting, economics, management, marketing, etc.). Bachelor of Science (BS) in Hospitality Management: Includes more math and science courses than a BA – useful for those interested in analytics and data science. We should point out that these are general guidelines. Many universities don’t make drastic distinctions between the BS, BA or the BBA, so check each program’s curriculum to see if it suits your interests. A bachelor’s degree in hospitality management follows a similar path to a general business degree. The curriculum mixes liberal arts courses with classes in public relations, accounting, administration, IT, marketing and personnel management. The main difference is that these classes concentrate on issues specifically related to the hospitality industry. For example, students may explore the “ins and outs” of food service management and catering, hotel operations and hospitality law. They may be trained to handle software used in reservations, billing and housekeeping management. What’s more, they can often choose an elective such as club management, special event management or gaming & social policy. Almost all bachelor’s programs include an advanced internship/externship to give undergraduates practical experience in hotels, resorts or hospitality settings. A master’s degree in hospitality management is a 1-2 year graduate program that prepares students for executive management positions, entrepreneurial ventures, advancement up the career ladder or a PhD. College graduates with a bachelor’s degree in a subject other than hospitality sometimes earn a master’s degree as a way to get into the industry. Master of Business Administration (MBA) in Hospitality Management: Professional degree with a focus on core business courses and vocational training. Master of Management in Hospitality (MMH): Professional degree with a focus on hospitality management training. Master of Professional Studies (MPS) in Hospitality Management: Professional degree with a focus on hospitality management training. Master of Science (MS) in Hospitality Management: Academic degree with a hospitality management curriculum. Some students use the MS as preparation for a PhD. Unless you wish to teach at the university-level, your master’s qualification will be considered a terminal degree (i.e. the highest qualification you’ll need). A master’s program in hospitality management builds on the foundation laid down in the undergraduate degree. As well as business classes like HR, accounting and customer service, the curriculum may also tackle the finer points of corporate structure, hospitality marketing/branding and large-scale administration. Some schools allow students to elect a concentration (e.g. brand management, development & asset management, global & regional standards, etc.). To give graduates real-world experience, universities incorporate a lot of on-site training into the degree program. Students take part in internships, collaborate on group projects and conduct their own research. The degree usually finishes with a capstone project or thesis. A PhD in Hospitality Management is a 4-7 year graduate program intended for hospitality professionals who wish to become university professors or conduct high-level hospitality research (e.g. new product development, management information systems, marketing and consumer behavior, etc.). Candidates are expected to write a doctoral dissertation. A PhD is not necessary to qualify for top-level management jobs. Most hospitality professionals find that an MBA has much more practical application. A certificate in hospitality management is a non-degree program that takes anywhere from a few months to 1 year to complete. In addition to universities and community colleges, there are many technical institutes and vocational/trade schools that offer hospitality courses and certificates. Undergraduate Certificate: A popular and less expensive alternative to the AAS degree. Graduate Certificate: A frequent choice for those have received a bachelor’s degree in another subject and/or who have prior experience in the field. Certificates tend to be focused on specific areas/skills. For example, a general hospitality management certificate might cover basic management and administration, front office procedures, labor issues, budgeting/financial fundamentals, branding/marketing and event planning. But there are also certificates that concentrate only on one area (e.g. food & beverage). Although a certificate doesn’t carry the same weight as a degree, it can be a useful addition to your résumé. Some people may earn a certificate in order to improve their chances when applying for management positions. Others might use it as an entry into an assistantship position under a department manager. We recommend your college or university has regional accreditation. This is a “seal of approval” granted to institutions (e.g. non-profit and public colleges and universities) by one of six regional accrediting bodies (e.g. North Central Association of Colleges and Schools). Regional accreditation only applies to a college or university, not the program itself. For a BBA or MBA, you may wish to see if the business school has accreditation from AACSB, ACBSP or IACBE. We take a closer look at these in our article on affordable MBA programs. If you want to be sure your hospitality management program is top of the heap, you can also look for ACPHA accreditation. The Accreditation Commission for Programs in Hospitality Administration (ACPHA) accredits ~60 hospitality management programs throughout the world. You don’t need to attend an ACPHA institution to qualify for federal financial aid. However, it is a useful marker of quality. It may also give you a leg up in professional certifications and job applications. The American Hotel & Lodging Educational Institute (AHLEI) is one of the most well-known organizations in the hospitality industry, and it offers a variety of voluntary certifications for hospitality professionals. To become certified, candidates must meet knowledge and experience requirements and pass the certification exam. Certified Hotel Administrator (CHA): Targeted towards hotel general manager and hospitality executives. Specialty Certifications for hospitality instructors, data analysts, spa supervisors, etc. Plus many, many more that we didn’t have room to list. If you’re confused about which certification to pursue, we recommend your discuss your choices with industry peers and mentors.